No, this isn't another VR headset. These are video goggles from DJI. 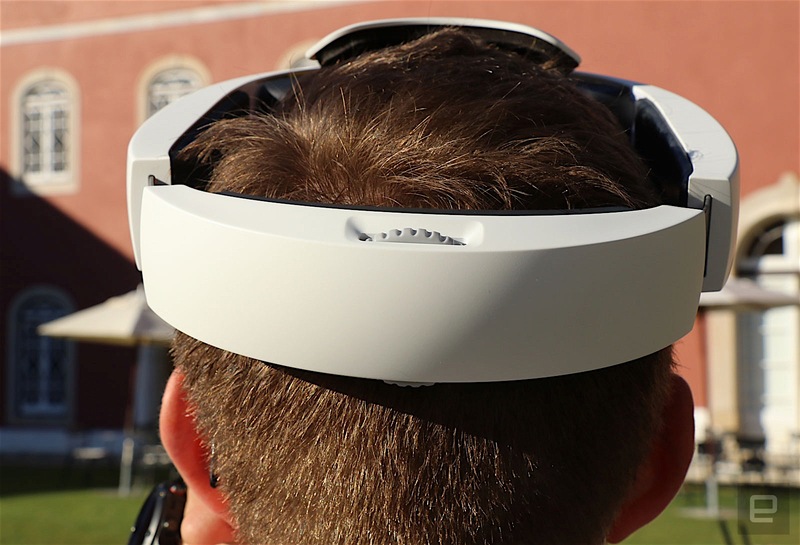 Why would you want a headset from DJI? Because it connects wirelessly to the company's new foldable Mavic Pro drone, giving you a live, bird's eye view from the camera (in 1080p no less). The idea isn't new, in drone circles it's pretty common to see bespectacled pilots, especially in racing, where "FPV" (as it's called -- first person view), is the only way to fly the drones at such breakneck speed. 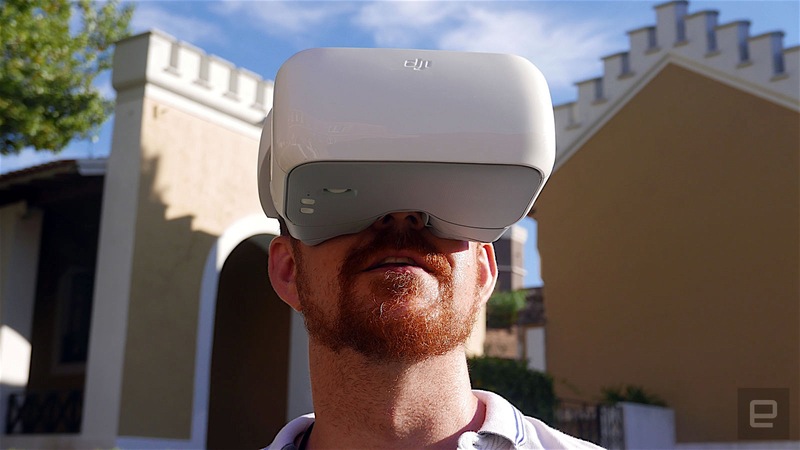 DJI announced the goggles (actually called "DJI Goggles") at its big Mavic launch event last week, but they weren't giving demos. We managed to get a rare ride inside them, and it's a whole bunch of fun. If you follow our drone news here on Engadget, you may have seen a similar pair from DJI's rival Yuneec. There's a lot in common between these two products, at least aesthetically, but DJI's offer a better resolution (full HD, rather than 720p) and connect wirelessly over the firm's proprietary "OcuSync" video link for a cable free experience. Right now, the goggles only work with the Mavic Pro, but you can expect more DJI drones to be compatibile going forward. Let's talk about the actual headset for a second though. It's pretty chunky (and not much of a hot fashion look), but the single adjustable hoop-style headband (similar to Sony's PSVR) makes them much more comfortable than the typical headband that tends to press VR headsets against your face. The front section may be large, but it doesn't feel heavy. On the inside are two 1080p panels (rather than one split screen), with an 85-degree field of view. This is a little less than what you'd find in an Oculus Rift or Vive (which offer around 90 to 100 degrees FOV), but it's still pretty good. On the base of the goggles are two buttons for navigating menus, and a scroll wheel for focus. There's also a flap on the side covering some connectors, but DJI didn't show us what was there in our demo. Hopefully there's at least HDMI input for doubling as a video viewer, and some rival headsets also can record the live feed to a memory card. There's also no mention of head-tracking to move the camera, unless it's being kept under wraps. The displays are incredibly bright and clear, and the video feed beaming down from the Mavic soaring above looked crystal clear and the connection was faultless. I had the benefit of one of DJI's experienced pilots at the sticks; it's not recommended you fly solo with these. If you can do so legally in your region (or you own lots of land), it changes the game completely. Not only is it straight up a much more immersive sensory experience, you can often fly more competently -- as you're always seeing from the front of the drone, which keeps your orientation "forward" whatever direction the drone is facing. There is also the option to connect two pairs of goggles to the same Mavic, meaning a friend can fly along with you. More traditional drone goggles go one further, using common radio frequencies, so anyone can tune in to the same ride, but it's still nice to be able to share the experience. Video goggles for drones come in all sorts of shapes and sizes (and price points). Usually the more affordable options require more work to connect them to your quad, or have a trade off in comfort, style and functionality. DJI's pair were the nicest I've seen in terms of build-quality and user experience, making them much friendlier to the mainstream user. What will really determine their success, though, is the cost. Yuneec's SkyView goggles will run you $250, and a pair of radio-based FatSharks about the same (depending on your resolution of choice). DJI hasn't put a price sticker on the Goggles yet, or confirmed a release date, but if it can match Yuneec, these will be the accessory to get for those hoping for a Mavic under the Christmas tree.